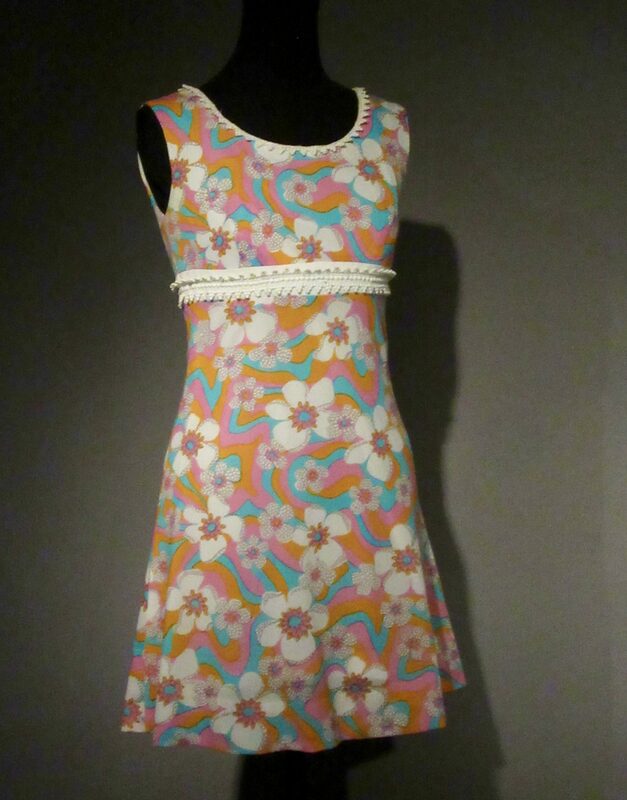 This Twiggy London Girl Dress (1966) was part of a product line by British teenage model Twiggy, so nicknamed due to her skinny, twig-like frame. The short, A-line construction plays on the silhouette that many designers were working with during the 1960s to free wearers from the heavily structured styles of the previous decade. 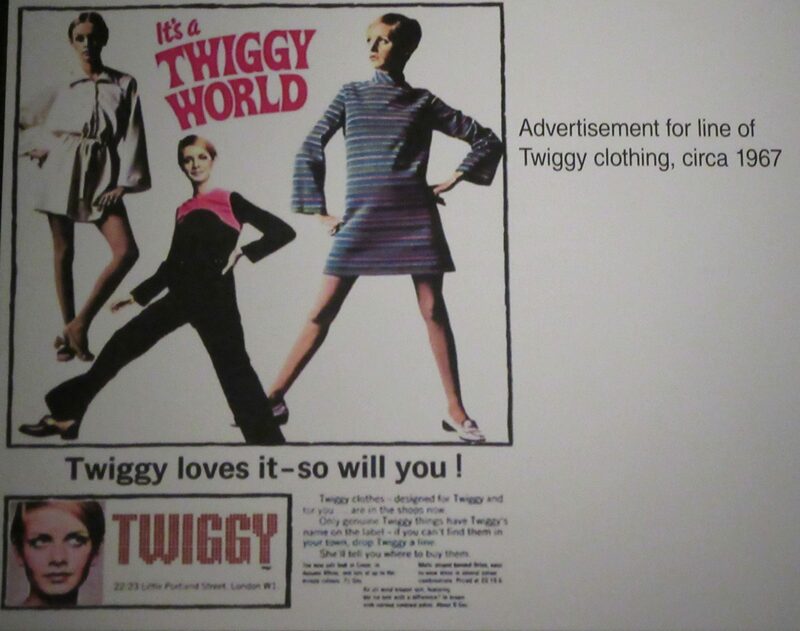 Twiggy came to embody the increasingly thin, youthful ideal of the ’60s and remains a key reference in debates about body image. Photographed in the Museum at FIT in Manhattan as part of the Exhibit, The Body: Fashion and Physique, on View Through May 5th, 2018. 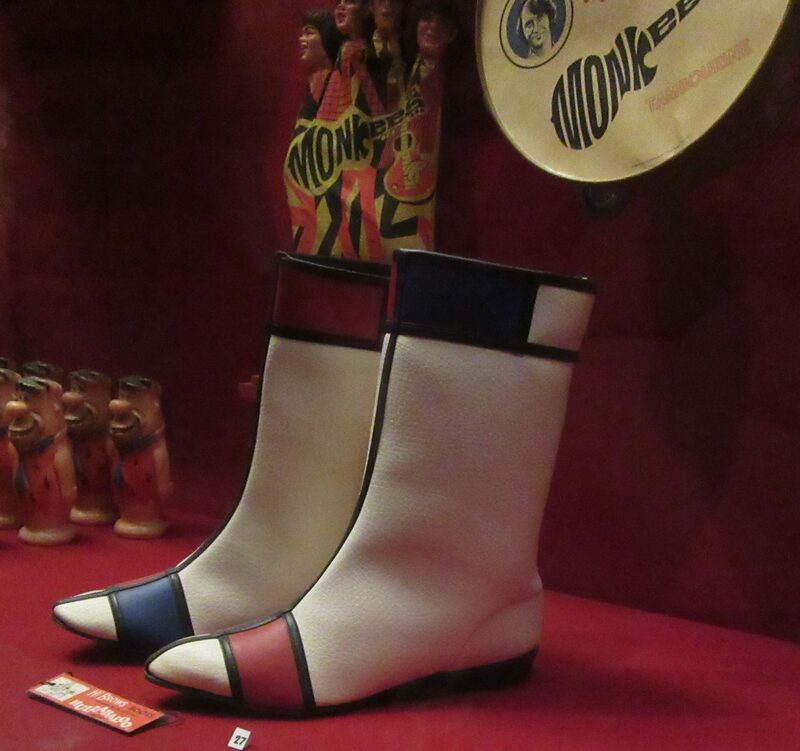 These extremely rare, retro-vintage Hi Brows Boots were worn by one of the GoGo dancers on the 60s-era TV show, Hullabaloo. Made of white vinyl with red and blue vinyl panels and black vinyl piping, the red and blue color block design was inspired by the non-representational paintings of Dutch artist, Piet Mondrian. 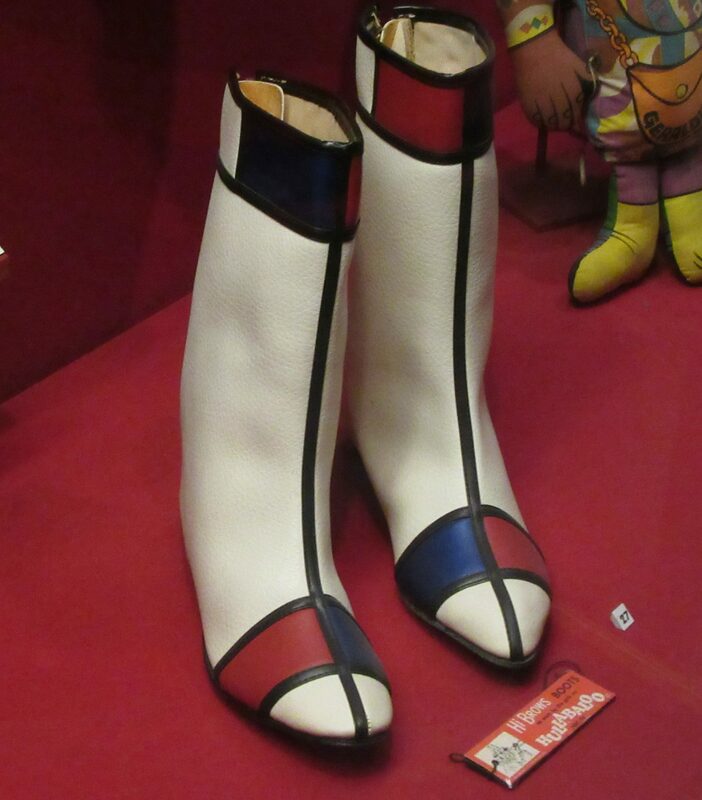 They are low heeled and below the calf in height, with a back metal zipper at the back. 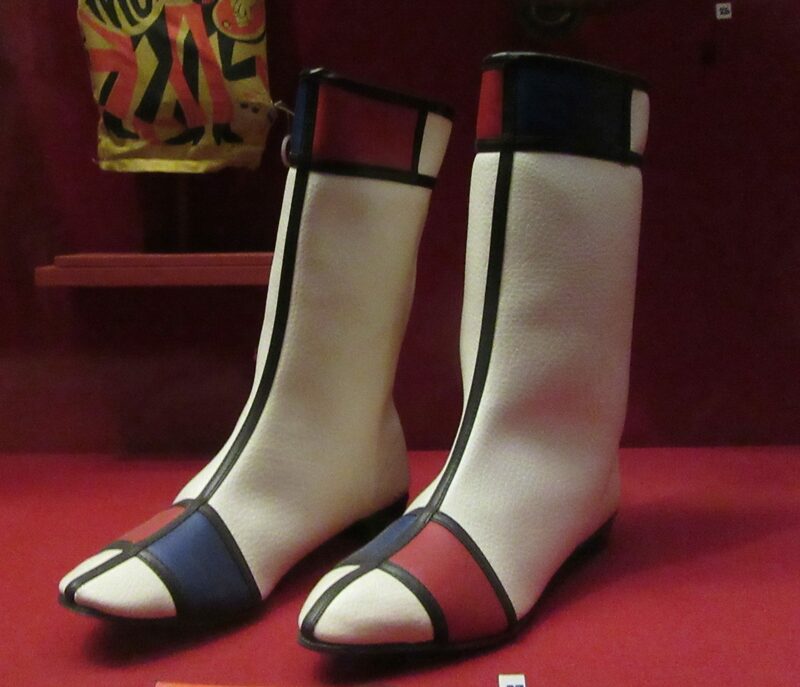 Why these boots originally sold for just a few dollars per pair, they can now fetch as much as $700 or $800 on eBay. Hullabaloo was a Pop Rock weekly variety show that ran from 1965 to 1966 (two seasons), NS was broadcast on the NBC network. As with ABC TVs Shindig, which began 4 months earlier, this series combined the musical trends of the day, The British Invasion, Detroit’s Motown sound and the merging Folk Rock trend. Unlike Shindig, this series featured a segment from Great Britain hosted by The Beatles‘ manager Brian Epstein, who presented “up and coming” groups. The weekly hosts, at NBC ‘s Burbank studio, included George Hamilton, Roger Smith, Noel Harrison, Paul Anka and Sammy Davis Jr. The performers, from both sides of the Atlantic, included The Four Seasons, The Beatles, Nancy Sinatra, Gary Lewis and The Playboys, Petula Clark, Barry McGuire, The Kinks, Herman’s Hermits, The Byrds and The Lovin’ Spoonful. Photographed in the Museum of the Moving Image in Astoria, Queens, NY. 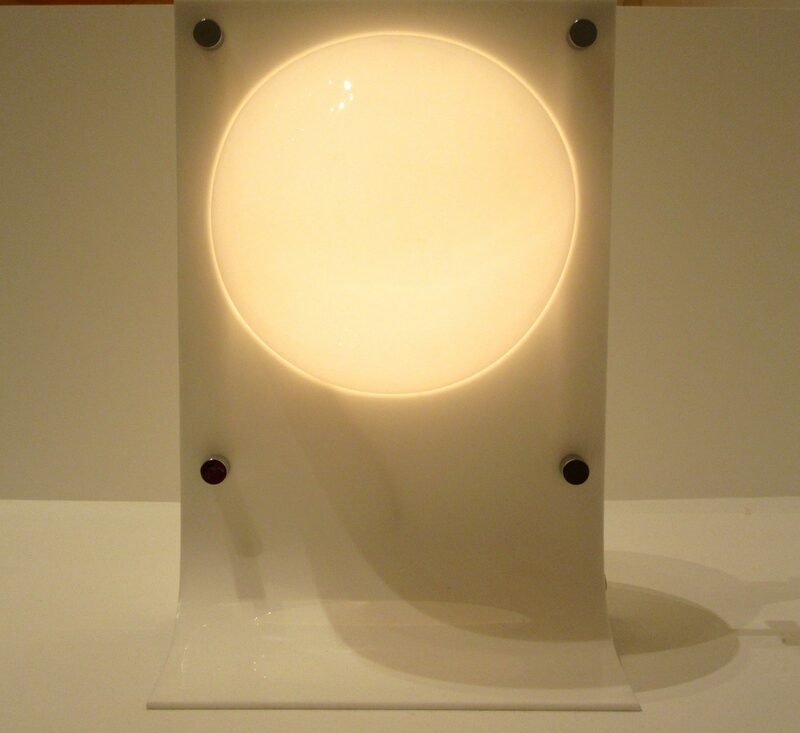 Area Lamp (model 1112), 1966 -67 was Photographed in the Museum of Modern Art in NYC. In the 1960s, youth culture asserted itself, changing society’s rhythms of mass production and consumption, and generating a sense of upheaval and freedom. The Pop Art movement emerged, taking inspiration from mass media and the everyday. 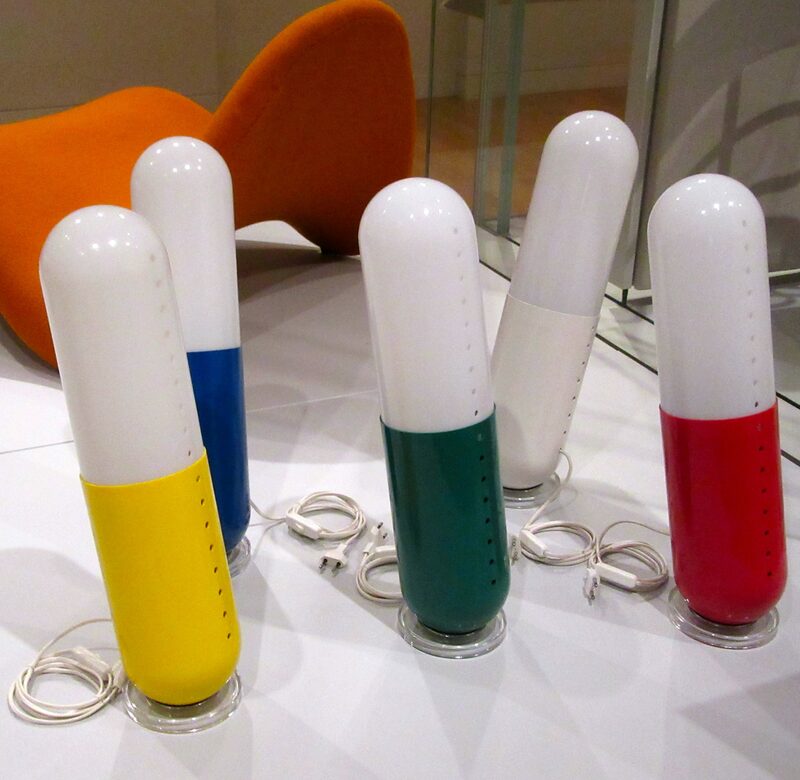 Bold colors, new material and radical forms characterized the work of artists and designers whose appropriation of the ordinary made brash or ironic statements. 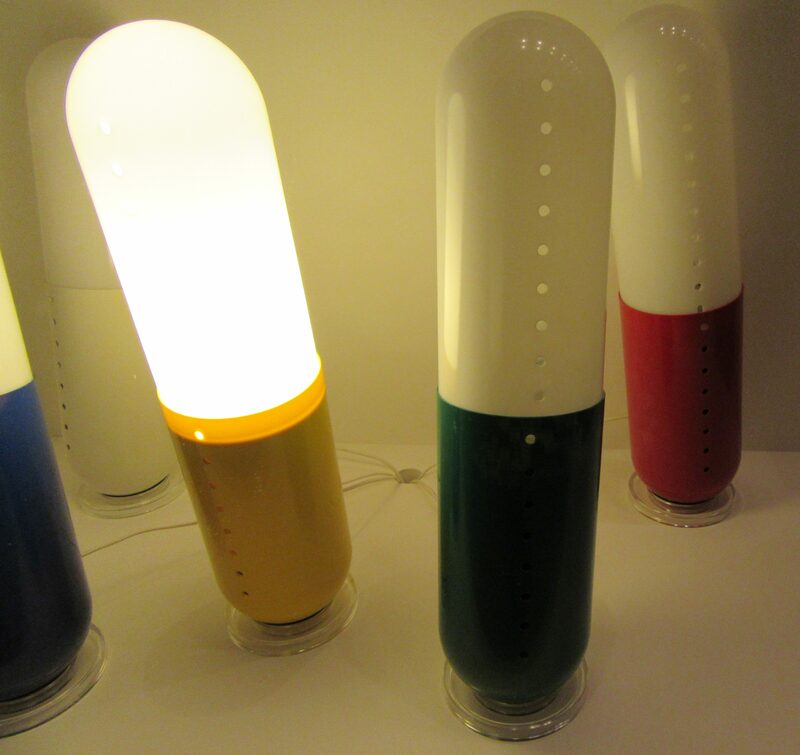 Italy’s anti-design movement of the mid-1960s and 1970s is fully expressed in the tongue-in-cheek spirit of the Pillola Lamps (1968, designed by C. Emanuele Ponzio, b, 1923). Challenging notices of “good design,” the anti-design movement took its visual cues from pop art’s use of bold colors and banal subject matter. 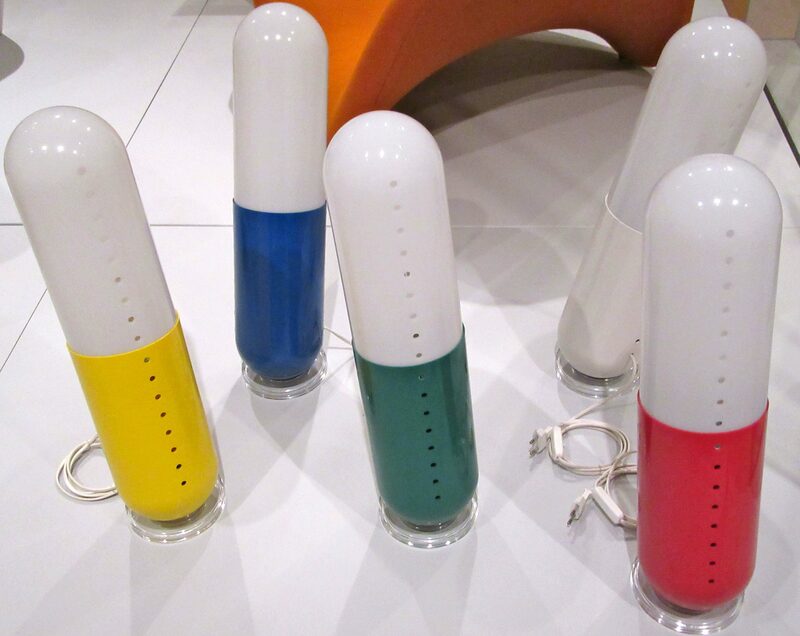 Conceived as a group, the lamps look like oversized pills poured from a giant medicine bottle. 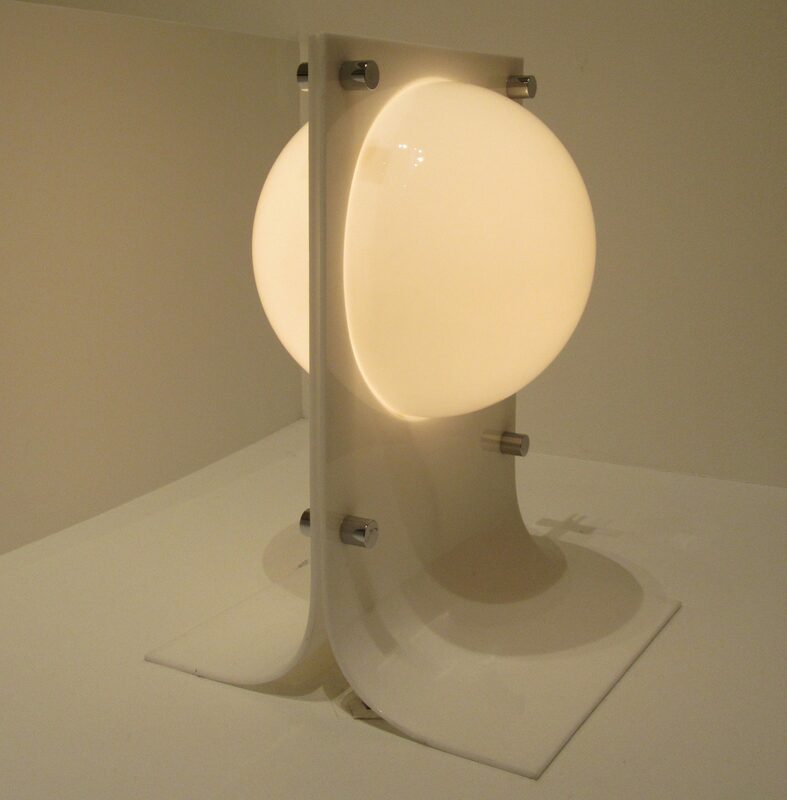 Illuminated Pillola Lamps Photographed at MOMA. Non-Illuminated Lamps Photographed at the Cooper Hewitt Design Museum in Manhattan. 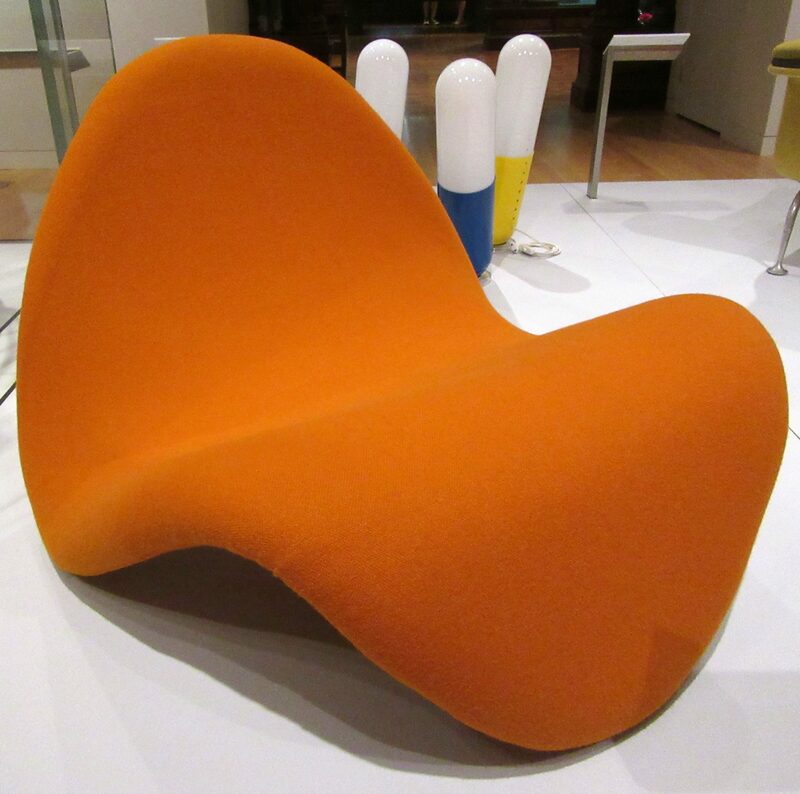 With its curvilinear form, the Tongue Chair (1967), designed by Pierre Paulin (1927 – 2009) demonstrates the innovative construction methods and synthetics that allowed Paulin to make highly sculptural upholstered furniture in the 1960s. 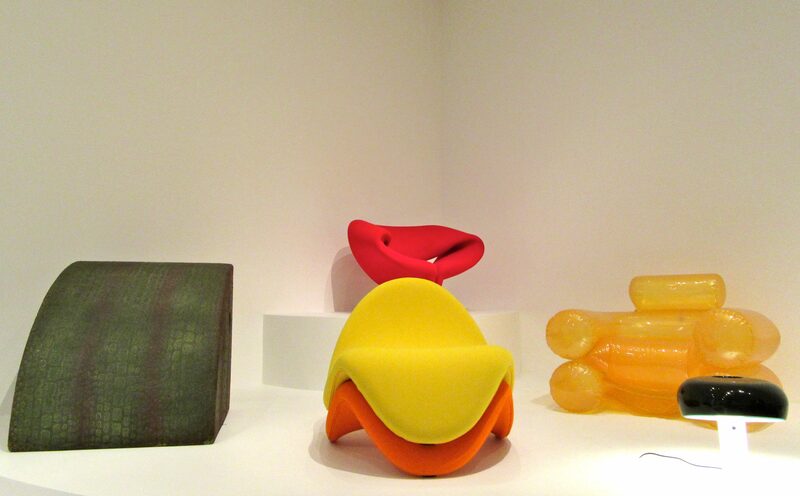 His forms foretell those of plastic furniture in the latter half of the decade.